Dinosaurs aren’t the only animals that roamed the earth during the prehistoric era. There was the Archelon, the largest turtle ever, measuring over 13 feet, and the Argentavis, the largest flying bird ever recorded, weighing in at over 140 pounds! Author Ginjer L. Clarke packs Maxed Out! with facts about humongous animals from the ancient past. Thanks for coming to my school I had a great time. I am sure Maxed out will be a good book and I am getting it. Thanks, I enjoyed visiting Amelia Elementary too. Enjoy the gigantic creatures of Maxed Out! Thanks for your kind words. I’m excited about Maxed Out! too and hope you enjoy it. hi mrs. clarke thank you for coming to my school today I LOVED IT! I have already read 1 of the books I bought today. I can’t wait to read more of your books! Thanks, Justin. I’m so glad you enjoyed my visit and books. Keep reading, and come back to my website to see fun stuff about my new books. Hi, Destiny. Thanks so much, I had fun visiting your school too. I hope you enjoy reading Maxed Out! as soon as it comes out. Keep reading! So far I like maxed out I like Smilodon and Andrewsarchus. I love reading your book at home. Great, Fabricio! Have fun reading about these ginormous creatures! I love your books, they are so COOL ! They are filled with wonderful facts about unbeleivable creatures from around the world. I hope you keep on writing these wonderful books ! Thanks for visiting us at Campbell ! Thanks, Karen! I really enjoy writing these books, and I love that you think they are cool. I had a great time at Campbell too. Happy Reading! I had fun when you came to my school, Wilderness Elementry I loved maxed out when you read it to us. Thanks, Maddy! I had fun too, and I’m glad you enjoyed my new book. Keep on reading! hi how are you today? Thanks for coming to Wilderness! I had fun taking a picture with you and hearing you read your book. I liked Maxed Out! For the series of Baby books you should write a “baby snakes”. If you could make it could you send Wilderness Elementary a copy? 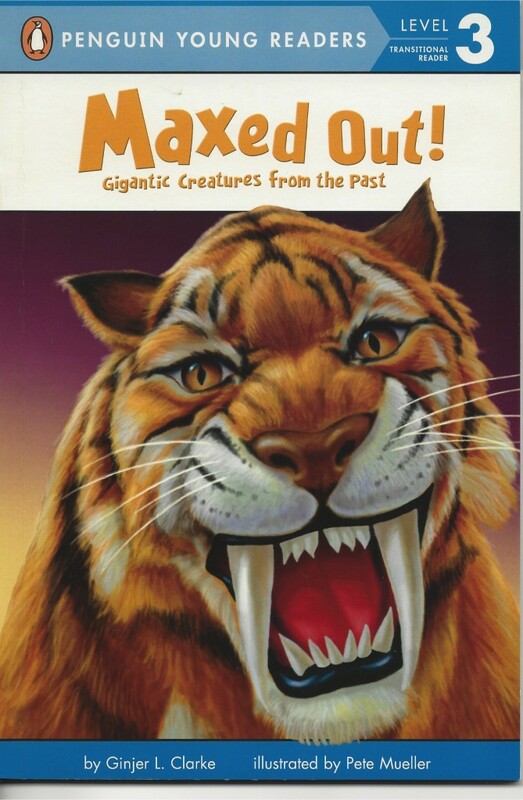 I loved it when you came to my school wilderness Max out was so cool i liked the big cat the was on the front cover with the big teeth also i have you book bug out mine came with tattos of bugs at the end of it so i just think you so cool. Hi, Max. Thanks for coming out to Reading Night at your school. I had fun too, and I’m so glad you like my new book. Thanks for the cool idea, Mia! Hi, you visited our school ,Our Lady of Loudes , I love maxed out awsome. Thanks, Breanna. I’m so glad you like Maxed Out! I had a great time visiting your school. Happy reading!
. thank you for visting my school . p.s.what is the largest anamal in the world. I’m glad you like Maxed Out! too, Eva. The largest animal alive now is the blue whale, and it is believed to be the largest animal that has ever lived, even bigger than the largest dinosaurs. Cool, huh?! Thank you for coming to Greenfield. Thanks, Grace! I had a great time visiting your school today. Happy Reading!